You are currently browsing articles tagged British Royal Marines. Reviewed by: R.Adm. William A. Heine, USNR (ret) and Colonel Michael D. Wyly USMC (Ret.) Both men were classmates of Colonel John Ripley, Class of 1962, U.S. Naval Academy, Annapolis. The captain would retire from the Corps as a full colonel in 1992. The writers of this review have known him since we were all 18-year-old plebes reporting to the U.S. Naval Academy in the Class of 1962. “Rip” as we called him died of an apparent heart attack in October 2008 and we each had conversation with him within a week of his death, knew him in the course of our own military careers, knew he was the hero who singlehandedly destroyed the bridge, but did not know how much a hero, had never heard Rip’s words quoted above, until we read Norman Fulkerson’s An American Knight. If you understand the title, you do not need to read the book. But read it anyway. It is an uplifting story. John W. Ripley with his wife Moline, after receiving the Navy Cross during the evening Parade at the Marine Corps Barracks in Washington D.C.
From Fulkerson we also learn that when asked to sign a contract for a possible movie about his actions, Rip imposed two conditions. Whoever portrayed him would not use profanity and would not be unfaithful to his wife. When it came to being an officer of Marines, Rip epitomized what this means in a way Hollywood might never understand. Simply put, Rip was a gentleman. Hollywood images of tough guys swearing and womanizing may attract throngs of ticket-buyers seeking an evening’s entertainment, but they fail to capture what service to one’s country and courage under fire really are. John captured them both, true to life. Fulkerson’s writing style is without pretense. One editor described the book as “an easy read.” It follows the chronology of Colonel Ripley’s life in sequence. No flashbacks or fast forwards. We meet his parents and the small town Radford, Virginia, where he grew up. We meet his bride to be and learn of his courtship and marriage. But without the author having to tell us, we sense where the story is taking us, that when Rip is called upon, he will do his duty, no matter the odds. And so it was with we who knew him. When we were all teenage midshipman Rip’s future had an inevitability about it. That he would be a Marine officer was a certainty. On this, he was thoroughly focused. Likewise, that he would stay in uniform for a full 30 years. That his specialty would be infantry. Our images of military life were formed in World War II. “Marine” meant hitting the beach in a landing craft with a drop-ramp bow and charging on foot against the enemy. That we would one day go to war to fight for our freedom seemed equally certain. Rip wanted to do that because he believed in what the country stood for. Add all this together and you knew Rip would be called upon to do his duty, to exercise immense courage under fire, and that he would rise to the occasion, never flinching. And with that ever-present broad smile on his face. 1967 Vietnam photo of then Captain John Ripley studying a map with his trademark smile. Rip had two tours of duty in Vietnam, the first as an infantry company commander. Here we read of his forbidding his Marines to shoot a pig because “it belongs to a farmer who needs to sustain a family.” And the same humanitarian thread continues as the bridge at Dong Ha finally blows into “massive chunks of concrete and steel spiraling through the air” while Rip holds in his arms a Vietnamese child whom he rescued from the impact area just in time. Rip’s story does not end when the bridge blows up. As a colonel he is assigned back to his Alma Mater at Annapolis. There, he sets an example to the young midshipmen in his charge, guides and mentors them, earning respect and love above and beyond anything we remember witnessing or hearing about in our own careers. His calm manner, his inner toughness, and his ready smile –all life-long traits– made it a morale boost just to be in the same room with him. Norman Fulkerson first met Colonel Ripley in 1993 when the Colonel delivered a speech for the launching of the book Nobility and Analagous Traditional Elites in the Allocutions of Pius XII at The Mayflower Hotel, Washington, D.C. In the ensuing years he kept in touch, personally, and read articles and books recounting the Colonel’s actions at Dong Ha, Vietnam, in 1972. He met Marines who had served with Colonel Ripley. The more the author learned of “Colonel Ripley the man,” the more he found himself thinking what a model citizen and model officer the colonel was. Finally, in 2007, a year before Colonel Ripley died unexpectedly, Mr. Fulkerson began to conceptualize a book about the Colonel’s life. 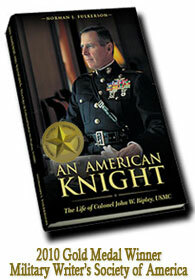 The material in An American Knight is drawn from a combination of conversations with Colonel Ripley; meetings and interviews with Marines and family members: several books and articles that have documented the Colonel’s courage in Vietnam, and the content of Colonel Ripley’s speeches that the author had attended over the years. R. Adm. William A. Heine, USNR (ret.) is an Annapolis classmate of John Ripley who served 38 years in the Navy. The bridge that John Ripley destroyed at Dong Ha was built in 1969 by a Seabee Battalion NMCB-62. Admiral Heine served as an Operations Officer of the Battalion just prior to its construction and was familiar with various aspects of the project. Colonel Michael D. Wyly, USMC (ret.) served two tours and distinguished himself as an outstanding Marine infantry officer in Vietnam. His early life and military career is chronicled in Robert Coram's book "Boyd". June 29, 2010 would have been the 71st Birthday of Colonel John Ripley. Although he is no longer with us his memory, as Mary Susan Goodykoontz says so well in this book review of An American Knight, will live on forever. 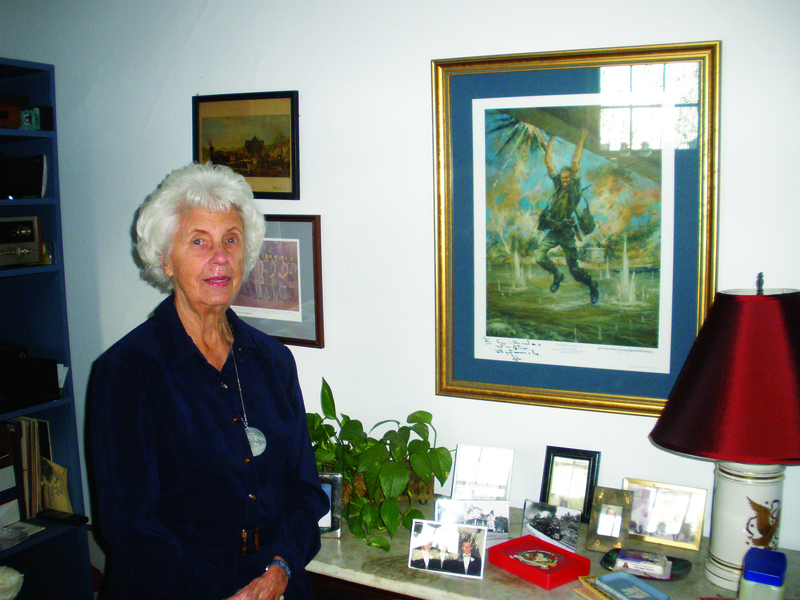 Mary Susan Goodykoontz at her home in Radford, Virginia with a picture of her brother John Ripley, dangling under the Dong Ha bridge to her left. “While the world knew my brother John as a Navy Cross recipient, I will always remember him simply as my darling little boy. Being the oldest member of our family I had the joy of caring for him as if he were my own child. It was for this reason that I was overjoyed when Norman Fulkerson contacted me, after John’s death, with the idea of writing a book about his life. “The final product, titled An American Knight, gave me the chance to see a side of John I frankly never knew. Although I was well aware of his heroism at Dong Ha, I did not know he was such a legend in the Marine Corps, because he did not tell me those things. John was very humble. Colonel Ripley with members of TFP Student Action. An old adage states that you only meet two great people in a lifetime. After visiting Col. John W. Ripley, I can say I met my first one. As Col. Ripley politely invited my colleagues from Tradition, Family and Property Student Action and me into his office on October 31, I felt tremendously honored to meet one of America’s greatest living war heroes — a man who served on active duty for thirty five years in the U.S. Marine Corps. Before serving two tours in Vietnam, he completed scuba, Ranger, airborne and jump master training. He was also an Exchange Officer to the British Royal Marines, during which time he participated in a Northern Malaysian campaign with the famous Gurkha Rifles. Diorama depicting Colonel John Ripley’s exploits in Dong Ha. It is located in Bancroft Hall at the United States Naval Academy in Annapolis, Maryland. Col. Ripley is most famous for blowing up the bridge at Dong Ha in Vietnam. He accomplished this act of epic heroism after three days of intense combat, without any food or sleep. A few sips of water from his canteen provided his only sustenance. This superhuman feat crippled the 1972 North Vietnamese Easter invasion which ended in defeat. Thus, the government honored Col. Ripley’s leadership, heroism and self-sacrifice at Dong Ha with a Navy Cross, America’s second highest military decoration. Members of the American Society for the Defense of Tradition Family and Property (TFP) present Colonel John Ripley with a rosary. "This rosary will not collect dust," said Colonel Ripley in response to this gift. Col. Ripley is also a man of faith. He attributes the destruction of the Dong Ha bridge to the grace of God and the Blessed Virgin Mary. He related how he felt all physical strength evaporate while placing explosives under the bridge. To continue, he composed a simple rhyming prayer: “Jesus, Mary, get me there… Jesus, Mary, get me there…” He repeatedly said this prayer on the bridge and a supernatural assistance came to his aid at a much-needed time. He stated: “This aid was tangible. It was all-consuming.” His mission would have been impossible without it. After this operation, Colonel Ripley’s mission was far from over. Unlike Hollywood movies, in which a bridge blows up and everyone lives happily ever after, the North Vietnamese found an alternate route. During the next days of fighting, Life Magazine published a famous picture of Colonel Ripley running as a mortar round blows up nearby. He showed us this amazing photograph during our meeting and many other war relics. Pointing to his picture, he recounted its exciting story. As the enemy approached within yards, he loaded the dead bodies of five news correspondents into an armored personnel carrier, putting himself in harm’s way. Then the armored personnel carrier left without him. He was stranded with the limp, lifeless body of his radio man. As the enemy drew closer, he refused to run for cover. Like the knights of old, he preferred to die rather then abandon his fellow soldier’s body. He would not leave his radio man behind even though he was in clear view of the advancing enemy. He picked up the body of his radio man and walked away very slowly, expecting a bullet to hit him at any moment. Suddenly, some South Vietnamese bodyguards or “cowboys,” as he called them, popped up over a ledge about 100 meters away and addressed him by his Vietnamese nickname, which meant “Captain Crazy.” They told him to duck while they sprayed cover fire allowing him to make a desperate 100-meter dash for safety. Smiling, Colonel Ripley recalled how he ran those 100 meters in 3 seconds! TFP member holds the three bullets that nearly took the life of Colonel Ripley. The fourth one he found on the Island of Iwo Jima. While showing us some of his war relics, he pulled something out of his pocket. It was a brass-colored safety pin that connected four bullets. Grinning, he said: “I am personally acquainted with three of these.” One bullet pierced through the deck of the chopper in which he was flying and struck a magazine clip on his ammo belt, barely stopping its entry into his abdomen! He also showed us a neatly arranged collection of stamps he had acquired from a captured North Vietnamese postal worker. The most interesting part of our meeting was when Colonel Ripley explained the essence of a true leader is one who sets the example and shows his troops how to act, rather than tell them what to do from a desk and ask them to report back. Colonel Ripley is one such leader. He never shied away from action, but always preferred to be on the front lines with his men. TFP member John Miller debates the Traditional Marriage issue with a student at Mount San Antonio College in Walnut California. the TFP Student Action debates on university campuses, he described the wonderful time he had appearing on Crossfire to debate a female Air Force general defending the need for women in the military. She could not stand up against the bulletproof logic of Colonel Ripley’s real life combat experience. Colonel Ripley deserves our tribute, respect and admiration. He taught us that to be a true leader one must have faith in God and Our Lady. He explained how being a leader means setting the example. Moreover, his heroic actions at Dong Ha speak even louder than his words. It was truly an honor and privilege to meet this model soldier, a man with profound zeal for the Catholic Church and high ideals for which he is willing to give his life. My TFP colleagues and I will never forget him. Colonel Ripley often referred to Moline as his "queen." On September 25, 2009, a small group of family and friends said their final farewell to Moline Blaylock Ripley. She died at her home in Annapolis, Md., on Saturday, September 12, 2009 at the age of 68. Moline was born in Bluefield, W.Va., on Pearl Harbor day, December 7, 1941, to Arnold Vincent and Edna Pais Blaylock. Her family eventually moved to Radford, Va. where she attended Radford High School and later went on to graduate from Madison College. Upon graduation, Moline Blaylock married John Walter Ripley a Marine who went on to earn legendary status during two tours of duty in Vietnam. Moline’s burial was actually the same day that the first biography of her husband was going to print. Although I had only met Moline on one occasion, I somehow felt I knew her through the writing of An American Knight, The Life of Colonel John W. Ripley USMC. (l to r) John, Stephen, Moline, Thomas and Mary. This photo was taken while John Ripley was in Okinawa for a year. It occupied a prominent place on Colonel Ripley's nightstand up until his death. Moline’s strength can be seen in a story related to me by Anne Devine, whose mother Patricia was Colonel Ripley’s older sister. As a battlefield commander, John Ripley experienced the horrors of war and dealt with the stress that often accompanies such a life. This entailed bad dreams which would wake him in the middle of the night. It was for this reason that Moline would meet her husband on his return trips from deployments and stay with him some days during his process of adjusting back to normal civilian life. In the last years of her life, Moline would have her own personal struggles when she noticed, as did other family members, that her memory was fading and suspected the cause. She showed rare courage in the face of what the problem might be and spoke with Miss Devine, whose mother, Patricia, died from complications due to Alzheimer’s disease. Moline was not seeking pity when she talked with Anne. Rather she wanted to know, not only, how the sickness affects the patient, but more importantly what impact it would have on the family members who would have to care for her. Mrs. Ripley was concerned about the burden they would have to endure and knew Anne would tell her the painful truth. Stephen Ripley, the oldest of the children, described how his mother faced Alzheimer’s disease with humor and dignity which was likely meant by Moline to ease their burden. Colonel John Ripley and wife Moline in England during his tour with the British Royal Marines with (l to r) sons Thomas, Stephen and daughter Mary. The other side of Moline was the compassionate side that worked hard to alleviate the suffering of those in need. Shortly after she was married, her husband was sent away for numerous training programs and deployments. While he was away, Moline acquired a position with the local school teaching first graders. The children under her care were from poor white sharecropper families. Some were so destitute, they lived in homes that were former tobacco barns with dirt floors. Seeing their unfortunate condition, Moline took it upon herself to prepare food baskets for the poorer families which she delivered during Christmas. Moline shared not only her husbands toughness but also his love of elevated things. During his funeral eulogy, Stephen depicted his mother as a woman who possessed a strong attraction for beauty and a person who possessed “refinement, determination and strength.” He illustrated this in an amusing way. Moline stalked antiques and beautiful things, he said, “like a big game hunter.” On one occasion he told how she spotted a truck full of leaves passing her on the highway with an oriental rug carelessly used as a tarp, thrown on top. She engaged in a high speed chase, stopped the truck and closed the deal to buy the carpet on the sidewalk. Her appreciation for such things is most likely the reason she chose to become an interior decorator. One of the more noteworthy houses she helped decorate was that of the celebrated home of the Marine Corps Commandant located at the historic barracks at 8th and I streets in Washington DC. What shown through most in Moline was this latter aspect of being a person of refinement and delicacy of soul. I had always seen her husband as a true American Knight, as I learn more about Moline, I am consoled to find in her the ideal counterpart, a true American Lady. Marine Corps body bearers carry the coffin of Moline Ripley up the front steps of the Naval Academy Chapel in Annapolis Maryland. What impressed me most about the funeral of Moline Blaylock Ripley, were the Marine Corps body bearers assigned to carry her coffin. To have the honor of being in this group, I was told, they must be able to carry a coffin at chest level for two miles without stopping. That means each Marine is carrying about 100 pounds. The other requirement is that they be at least six-feet-tall. When I approached them, I felt like I had wandered into a land of giants; gallant men dressed in noble uniforms. Three of them had also carried the coffin of Colonel John Ripley to its final resting place and now they would take his wife to be placed by his side. They were men –I described in an article about Colonel Ripley’s funeral– who looked like they were carved out of granite. I watched these burly Marines, gently carry the coffin up the steps and could not help contrast their militant manners and fierce determination in their eyes, with the mental image of Moline, a gracious Southern lady. They were not carrying the coffin of a warrior this time, but that of his fair lady. As they entered the Church I stepped off to the side and gazed on in awed silence. The scene was an image of the chivalrous spirit, so lacking in the world today, of the respectful way men should treat women. I imagined someone trying to approach Moline’s coffin with disrespect and took delight in what I knew would be the response of these gigantic men. It was noteworthy how they did not carry the heavy coffin in a begrudging way but with pride and loyalty. Moline was as much an American Lady as her husband was a an American Knight. The Marine Corps body bearers were making sure she reached her final resting place with dignity. One would expect nothing less from the Marine Corps. Upon arriving at the burial sight the body bearers carried the coffin to its final resting place. Before laying it down, however, they raised the coffin of Moline on high as they had done for her husband before Father McGeory gave his final blessings for the deceased. It could not have been a more appropriate conclusion to this fine lady’s funeral, considering the battle waged by her husband against sending women into combat. The reason Colonel Ripley so strongly opposed such a ludicrous proposition was because of his respect, not his disdain for women. Marine Corps body bearers raising the coffin of Moline Ripley before the final blessings. "Vaunted on high" as Colonel John Ripley would have wanted it. Our sincere condolences to Stephen, Mary, Thomas and John Ripley.